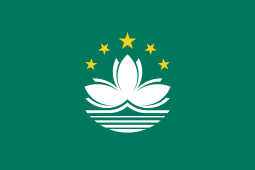 "South of the Lake (Dòngtíng)"
Hunan Province (Chinese: 湖南; pinyin: Húnán; Hunanese: Shuangfeng, [ɣəu˩˧læ̃˩˧]; Changsha, [fu˩˧lã˩˧]) is a province of the People's Republic of China. 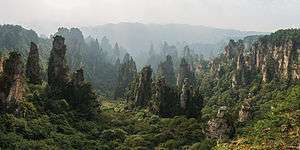 It is located in South Central China, south of the middle course of the Yangtze River, and south of Lake Dongting (hence the name Hunan, which means "south of the lake"). Hunan is sometimes called for short and officially abbreviated as "湘" (pinyin: Xiāng), named after the Xiang River which runs through the province. Hunan and Hubei became a part of the province of Huguang (湖廣) until the Qing dynasty. Hunan province was created in 1664 from Huguang, renamed to its current name in 1723. Hunan was relatively quiet until 1910 when there were uprisings against the crumbling Qing dynasty, which were followed by the Communist's Autumn Harvest Uprising of 1927. It was led by Hunanese native Mao Zedong, and established a short-lived Hunan Soviet in 1927. The Communists maintained a guerrilla army in the mountains along the Hunan-Jiangxi border until 1934. Under pressure from the Nationalist Kuomintang (KMT) forces, they began the Long March to bases in Shaanxi Province. After the departure of the Communists, the KMT army fought against the Japanese in the second Sino-Japanese war. They defended the Changsha until it fell in 1944. Japan launched Operation Ichigo, a plan to control the railroad from Wuchang to Guangzhou (Yuehan Railway). Hunan was relatively unscathed by the civil war that followed the defeat of the Japanese in 1945. In 1949, the Communists returned once more as the Nationalists retreated southward. Former Chinese Premier Zhu Rongji is also Hunanese, as are the late President Liu Shaoqi and the late Marshal Peng Dehuai. 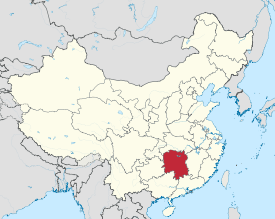 Hunan is located on the south bank of the Yangtze River, about half way along its length, situated between 108° 47'–114° 16' east longitude and 24° 37'–30° 08' north latitude. It covers an area of 211,800 square kilometres (81,800 sq mi), making it the 10th largest provincial-level division. 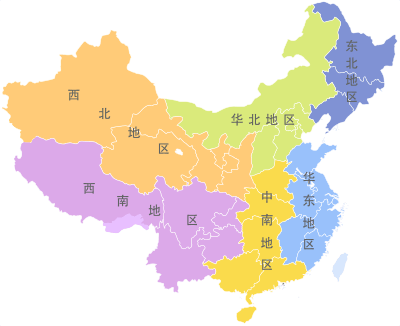 The east, south and west sides of the province are surrounded by mountains and hills, such as the Wuling Mountains to the northwest, the Xuefeng Mountains to the west, the Nanling Mountains to the south, and the Luoxiao Mountains to the east. The mountains and hills occupy more than 80% of the area and plains comprises less than 20% of the whole province. 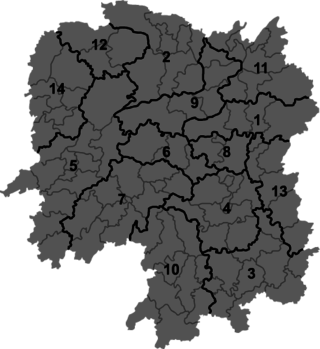 The fourteen prefecture-level divisions of Hunan are subdivided into 122 county-level divisions (35 districts, 16 county-level cities, 64 counties, 7 autonomous counties). Those are in turn divided into 2587 township-level divisions (1098 towns, 1158 townships, 98 ethnic townships, 225 subdistricts, and eight district public offices). 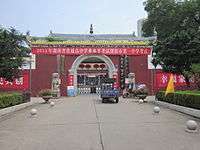 The predominant religions in Hunan are Chinese folk religions, Taoist traditions and Chinese Buddhism. According to surveys conducted in 2007 and 2009, 20.19% of the population believes and is involved in ancestor veneration, while 0.77% of the population identifies as Christian. The reports didn't give figures for other types of religion; 79.04% of the population may be either irreligious or involved in worship of nature deities, Buddhism, Confucianism, Taoism, folk religious sects, and small minorities of Muslims. 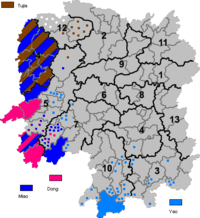 Xiang Chinese (湘語) is the biggest native language to Hunan province, and it is also a group of Chinese dialects spoken in most parts of Hunan and in a few adjacent areas. Located in the south central part of the Chinese mainland, Hunan has long been known for its natural beauty. 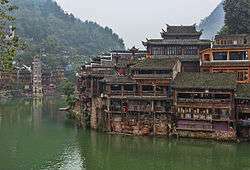 It is surrounded by mountains on the east, west, and south, and by the Yangtze River on the north. Its mixture of mountains and water makes it among the most beautiful provinces in China. For thousands of years, the region has been a major center of agriculture, growing rice, tea, and oranges. China's first all glass suspension bridge was also opened in Hunan, in Shiniuzhai National Geological Park. 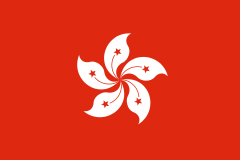 ↑ "Doing Business in China – Survey". 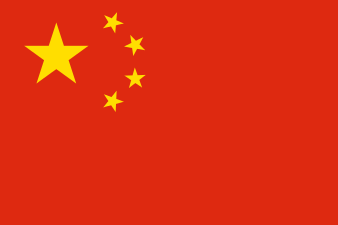 Ministry Of Commerce – People's Republic Of China. Retrieved 5 August 2013. ↑ "National Data: Annual by Province". National Bureau of Statistics of China. 29 April 2011. Retrieved 4 August 2013. ↑ Harold Wiens. Han Expansion in South China. (Shoe String Press, 1967). ↑ Alfreda Murck (2000). Poetry and Painting in Song China: The Subtle Art of Dissent. Harvard Univ Asia Center. ISBN 978-0-674-00782-6. ↑ 中华人民共和国民政部 (August 2014). 《中国民政统计年鉴2014》. 中国统计出版社. ISBN 978-7-5037-7130-9. ↑ Roberts, Edmund (1837). Embassy to the Eastern Courts of Cochin-China, Siam, and Muscat. New York: Harper & Brothers. p. 123. ↑ "中华人民共和国国家统计局关于第一次全国人口调查登记结果的公报". National Bureau of Statistics of China. Archived from the original on August 5, 2009. ↑ "第二次全国人口普查结果的几项主要统计数字". National Bureau of Statistics of China. Archived from the original on September 14, 2012. ↑ "中华人民共和国国家统计局关于一九八二年人口普查主要数字的公报". National Bureau of Statistics of China. Archived from the original on May 10, 2012. ↑ "中华人民共和国国家统计局关于一九九〇年人口普查主要数据的公报". National Bureau of Statistics of China. Archived from the original on June 19, 2012. ↑ "现将2000年第五次全国人口普查快速汇总的人口地区分布数据公布如下". National Bureau of Statistics of China. Archived from the original on August 29, 2012. ↑ "Communiqué of the National Bureau of Statistics of People's Republic of China on Major Figures of the 2010 Population Census". National Bureau of Statistics of China. Archived from the original on July 27, 2013. 1 2 3 China General Social Survey 2009, Chinese Spiritual Life Survey (CSLS) 2007. Report by: Xiuhua Wang (2015, p. 15) Archived September 25, 2015, at the Wayback Machine. ↑ stin Jon Rudelson, Justin Ben-Adam Rudelson (1992). Bones in the sand: the struggle to create Uighur nationalist ideologies in Xinjiang, China. Harvard University. p. 30. Retrieved 2010-06-28. ↑ Chih-yu Shih, Zhiyu Shi (2002). Negotiating ethnicity in China: citizenship as a response to the state. Psychology Press,. p. 133. ISBN 0-415-28372-8. Retrieved 2010-06-28. ↑ Chih-yu Shih, Zhiyu Shi (2002). Negotiating ethnicity in China: citizenship as a response to the state. Psychology Press,. p. 137. ISBN 0-415-28372-8. Retrieved 2010-06-28. ↑ Chih-yu Shih, Zhiyu Shi (2002). Negotiating ethnicity in China: citizenship as a response to the state. Psychology Press,. p. 138. ISBN 0-415-28372-8. Retrieved 2010-06-28. ↑ Chih-yu Shih, Zhiyu Shi (2002). Negotiating ethnicity in China: citizenship as a response to the state. Psychology Press,. p. 136. ISBN 0-415-28372-8. Retrieved 2010-06-28. ↑ "China's first glass-bottom bridge opens - CNN.com". CNN. Retrieved 2015-09-29. Chisholm, Hugh, ed. (1911). "Hu-nan". Encyclopædia Britannica (11th ed.). Cambridge University Press.